When it comes to motorcycles, it’s about more than just power; it’s about the aesthetic too. You don’t just want to go fast, you want to look and sound good doing it. This is something that the staff at Magnaflow know all too well, and they’ve taken it upon themselves to make that beautiful rumble with their own exhaust systems. They’ve been doing this for 30 years, and over that time, they’ve all but perfected the process. Here at Dennis Kirk, we know a good exhaust when we hear it. When we first saw and heard those from Magnaflow, we knew we had to stock them for ourselves. That’s why you see this great selection of Magnaflow Harley exhausts on our website! Magnaflow makes both slip-ons and full exhaust systems, plenty of both. And this isn’t the end of the variations; some are black, some are chrome. Some have a scallop cut, and some have a megaphone appearance. If you know exactly what you are looking for, don’t waste time sifting through products that you wouldn’t like anyways. Use the categories on the left side of the screen to cater the products on the screen to your specific interests. You can divide the results by various attributes, including style, color, price, and more. 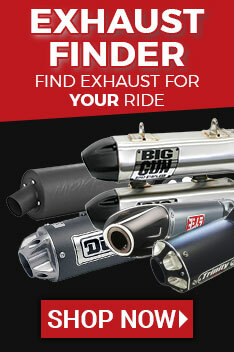 Full exhaust systems are fitment specific. Don’t waste time sifting through systems that won’t fit your bike. Tell us what kind of bike you ride at the top of the screen and we will show you all of the exhaust systems that will fit your ride. Once you’ve found everything that you came for, place your order! We pride ourselves on shipping orders over $89 for free, and we have a feeling that you will probably qualify. When you’ve gotten your order and tried out your new exhaust system, come back and leave a product review! Customers just like yourself will value your opinion, they would thank you for it if they could.